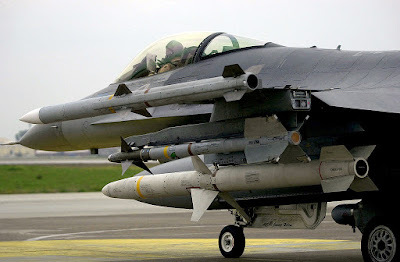 After months of negotiations - and clashes between its troops and fighters of the Islamic State in Iraq and Syria (ISIS) on the Syrian border - Turkey has agreed to allow the United States to launch airstrikes from the large NATO air base in Incirlik. There were rumors last fall that the Turks were going to allow the Americans to use the base, but an agreement fell through because of Turkish perceptions of the lack of commitment on the part of the Obama Administration to the removal of the Syrian regime of President Bashar al-Asad. The Turks have always wanted American support for its efforts to oust al-Asad. It is not clear what, if any, concessions were made to the Turks other than an agreement to assist Turkey in creating a buffer zone inside northern Syria. This is a welcome development - it significantly reduces the flight time from the airbases currently being used in Jordan, Kuwait, Qatar, and the United Arab Emirates. Not only can the aircraft arrive in the target area faster, they are able to remain in the area for longer periods of time dropping significantly more ordnance. The shorter flight distance also reduces the number of aerial refuelings needed, lessening the demands on the heavily used tanker aircraft fleet. Had coalition aircraft been able to stage from Incirlik during the fighting in the Kobani area last year and again early this year, the flight distance to target would have been as short as 165 miles versus the 800 to 1500 miles using bases in Jordan and the Gulf. The battle for the city may have been shortened significantly. Access to Incirlik will allow increased air operations against ISIS's self-proclaimed capital at al-Raqqah in northern Syria, just 200 miles from the airbase. Translated into time, that means that American pilots can put weapons on targets in the ISIS capital in as little as 50 minutes. Aircraft based in southern Turkey can also react more quickly to the changing situation on the ground in both northern Syria and western Iraq. The reaction time to fast-changing events on the ground in northern Syria can be measured now in minutes, not hours. This becomes even more important as ISIS forces move closer to Aleppo, Syria's largest city. According to press reports, the United States will operate both manned aircraft and Predator drones from Incirlik - at least two of the Predators will be armed with Hellfire missiles. It was an MQ-1 Predator that recently (July 8) killed a senior al-Qa'idah operative about 20 miles west of Aleppo, or just 90 miles from Incirlik. These operations will be much easier to launch from the Turkish base - more quickly and likely more effectively. The Turks have stated that they still will not participate in coalition air operations, using their air assets only in response to threats to Turkey, its people or its armed forces. They may provide tactical air controllers inside Syria to call in American airstrikes. Although we would prefer to have Turkish troops and pilots directly involved, use of Incirlik is a welcome change. I have often complained about the lack of support for coalition operations by the Turks. My exact words were, "If Turkey wants to be a NATO ally, they need to start acting like a NATO ally." It appears that they are - finally. REDUX: "Fallout of a bad nuclear deal with Iran" and "The nuclear deal with Iran - the view from Riyadh"
As you all know, the five permanent members of the United Nations Security Council and Germany, also called the P5+1, concluded an agreement with Iran that the Obama Administration claims blocks all of the possible paths for Iran to acquire a nuclear weapon. Most analysts familiar with the Middle East and the Iranians believe this is fantasy. I wrote an article about this when the announcement was made. You have probably read it - if not - Iran Nuclear Deal - Lingering Concerns. Much of my opinion and analysis in that article is based on my writings earlier this year, although I have been writing about the threat posed by the Iranian nuclear weapons program (let's call it what it is, shall we?) for almost a decade. After the signing of what I consider a bad deal, I was asked to re-post two articles from earlier this year. To preclude you having to connect to external links, I have included the text of the two articles here. Fallout of a nuclear-armed Iran? Recent polls taken in the United States indicate that an overwhelming majority of Americans - between 70 and 80 percent - do not believe that the proposed agreement between the Islamic Republic of Iran and the P5+1* (United States, United Kingdom, France, Russia, China and Germany) will prevent Iran from eventually acquiring a nuclear weapons capability. Despite Presidential spokesperson Josh Earnest's claims to the contrary, few people believe President Obama "is driving a hard bargain." The proposed agreement will provide Iran immediate sanctions relief, permit them to legally enrich uranium to the five percent level, and lift all restrictions on Iran's nuclear program after a ten year period of compliance. To most observers (including this one), that sounds like a great deal for Iran, and a bad deal for the rest of the world - not exactly the result of a "hard bargain." The Administration realizes that neither the majority of the American people nor the Congress support the "hard bargain" the President's team is negotiating with Iran. Continuing in the vernacular, most Americans believe that instead of a "hard bargain," the President is "giving away the farm." I believe that lack of popular support is the reason why the United States and some of its European allies are beginning talks in the United Nations (UN) to forge a Security Council resolution to remove UN sanctions on Iran if a nuclear deal is reached. The Administration, led by Secretary of State John Kerry, is trying to circumvent Congress and in effect the American people to make a deal with Iran. Perhaps the State Department deputy spokesperson was right in her condescension - we American people just don't understand the "nuances" of these negotiations. I have been forthright and forceful in my condemnation of what I believe is an unwise agreement with the Islamic Republic of Iran. Although the President has "convinced" (read: directed) his Director of National Intelligence (DNI) Jim Clapper to omit references to Iran (as well as its proxy in Lebanon - Hizballah) from the latest annual threat assessment delivered to the Senate Armed Services Committee, Iran remains the world's primary state sponsor of terrorism. 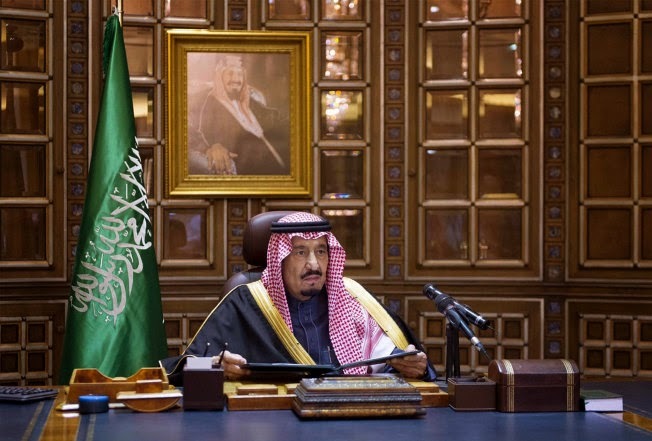 Off to the races - Saudi Arabia to develop nuclear energy (April 17, 2010). Quote: "Saudi Arabia is looking across the Persian Gulf at what is likely the world's next nuclear-armed nation. 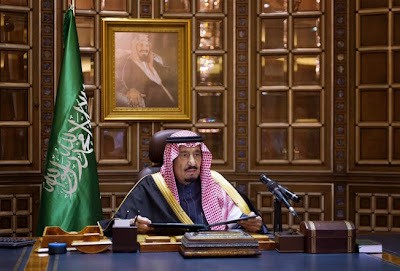 The Saudis, long-time American allies, are unsure of the direction of American foreign policy in the region and probably think they may need something to counter Iran's accession as a regional power. A Saudi nuclear energy research and development center is the logical answer - after all, that's how Iran's program got started." Mr President - take a lesson from the UAE ambassador (July 7, 2010). Quote: "Here is where [the UAE ambassador] gets even clearer: 'We cannot live with a nuclear Iran. The United States may be able to live with it; we can't.' If the United States will not fulfill its traditional leadership role in the region - which includes protection for the Gulf Arab states - these states will be forced to either make an accommodation with Iran, or in the case of larger countries like Saudi Arabia and Egypt, acquire their own nuclear arsenal." "Fallout" from the Iranian nuclear program (August 28, 2010). Quote: "As Iran continues to develop its nuclear programs - power and weapons - it is only logical for other nations in the region to do the same. It is just a matter of time before we see more nuclear-armed states in this volatile region. This is the 'fallout' of Tehran's program." The coming nuclear arms race in the Middle East (December 5, 2011). Quote: "The King told [National Security Advisor] General Jones that if Iran succeeded in developing nuclear weapons, everyone in the region would do the same, including Saudi Arabia. The King is convinced that current U.S. engagement efforts with Tehran will not succeed." 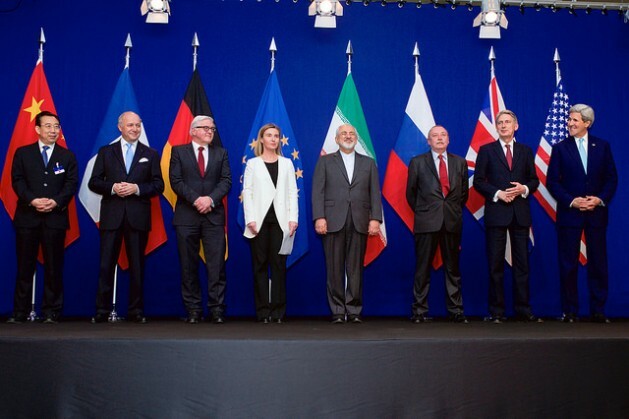 The "fallout" of a bad deal, or possibly any deal short of Iran scrapping its nuclear program, is the triggering of an arms race in the region. 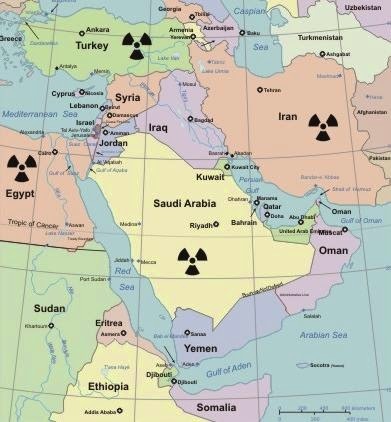 The major countries in the region - Saudi Arabia, Egypt and Turkey - two Arab and all three Sunni Muslim - are not going to sit idly while Iran develops the capability to develop nuclear weapons to mount atop its huge arsenal of ballistic missiles. The three powers are wary of a Persian, Shi'a state sponsor of terrorism armed with nuclear weapons. This deal, a bad one in my judgment, does nothing to assuage those fears. * The P5+1 group comprises the five permanent members of the United Nations Security Council (United States, United Kingdom, France, Russia and China) plus Germany. It appears almost inevitable that the Obama Administration is going to push through the completion of what many to consider to be a mediocre-at-best agreement with the Islamic Republic of Iran over its nuclear program. Regardless of the hard sales pitches by both the President and Secretary of State John Kerry, the Iranians remain focused on the acquisition of a nuclear weapons capability. I believe they will ultimately be successful. I am not the only one that believes that the Iranians will eventually have nuclear weapons - it already has the ballistic missiles to deliver them. One need only look to the west across the Persian Gulf to find the country (with the understandable exception of Israel) most concerned with the Iranian nuclear arms program - the Kingdom of Saudi Arabia. The Saudis have been wary of Iran since the 1979 revolution and Tehran's desire to export that revolution throughout the region. Since 1982 when Iran's Islamic Revolutionary Guard Corps (IRGC) Syria and Lebanon contingent (forerunner of today's Qods Force) began operations in Lebanon and created Hizballah, the Iranians have been a major force in the politics of both countries. After the American invasion of Iraq in 2003 and the subsequent civil war, Iran has meddled incessantly in Iraqi politics - after the premature removal of American forces in 2011, Iran became the major power broker in the country. Some say it remains that to this day. The recent and ongoing crisis in Yemen has Tehran's handwriting all over it. The Shi'a Houthi group is sponsored, equipped and funded by the Iranians. If you are sitting in Riyadh, you see Iran wielding significant influence in four Arab capitals - Beirut, Damascus, Baghdad and now Sana'. Iran is constantly displaying new, indigenous weapons, including more capable and longer range ballistic missiles. The Saudis have reason to worry - they, like most rational observers of Middle East events, are convinced that Iran will at some point in the next few years, possess nuclear weapons. Although some of the situation in the Middle East has changed since I wrote that, such as the hope that Syria could be part of a counter to Iran and the fact that there is a new king in Saudi Arabia, the rest still holds true. I assess that new Saudi King Salman has already given the orders to the new Minister of Defense and Aviation (his son), to scope out what it would take to acquire at least the same capability as Iran. Of course, by doing so the Saudis may run afoul of the Obama Administration. However, the Administration has proven that they are willing to allow other countries to enrich uranium in contravention of international agreements with little consequence. If you are living in the Persian Gulf region, the overly optimistic assurances from President Obama and Secretary Kerry that their agreement with Iran will prevent the Iranians from acquiring a nuclear weapons capability ring hollow. If I was King Salman, I would do the same thing. The Obama Administration is touting the conclusion of "the historic deal that will prevent Iran from acquiring a nuclear weapon." Preventing the Islamic Republic of Iran from acquiring nuclear weapons is critical to any hope for preventing the entire Middle East from erupting into a conflagration. The White House has issued a slick spin of the deal on its website. You can read the actual text for yourself. While you read the White House version of reality, take a look at the photograph above. It tells us just who we are being asked to believe has negotiated in good faith - those are officially sanctioned Iranian demonstrations calling for death to America, Israel, United Kingdom, the House of Sa'ud (Saudi Arabia) and the Islamic State in Iraq and Syria (ISIS). Let me first say that I hope that this deal works. A nuclear weapon in the hands of the mullahs in Tehran would be a disaster, not just for the Middle East, but the entire world. That said, I am concerned that the deal as structured may not prevent Iran from acquiring a nuclear weapons capability. I am not confident that this Administration has negotiated the type of agreement that will be successful. Why do I say that? I have been straight-forward in my assessment that since he took office in 2009, President Obama sought to curry favor with the Islamic regime in Iran, despite the enmity and hostility from that regime. His attempts to make inroads with the leadership in Tehran were consistently rebuffed. It was not until he directed his negotiators, including current Secretary of State John Kerry, to make concession after concession in the nuclear talks - caving on virtually every negotiating point - that the Iranians began to listen to Barack Obama. The Iranian leadership likely assessed - correctly, in my opinion - that Obama was desperate for a deal with Iran, for whatever reason. It appears to me that the goal of the negotiations was to reach a deal - any deal - with Iran rather than actually achieving the stated objective of preventing Iran from acquiring nuclear weapons. Otherwise, Obama would have stood firm on what we were all told were non-negotiable conditions - sanctions relief only after compliance, anytime and anywhere inspections, continued arms embargo, etc. So now we have an agreement, technically, a joint comprehensive plan of action. What has changed? Does anyone actually believe that the Iranians have given up their quest for a nuclear weapons capability? What is the end-goal of their nuclear research and development program? Is this Administration ready to believe that Iran is only interested in a nuclear electrical power generation system? That thought might be the fiction that Kerry and Obama have bought into, but the analysis from specialists at the government's own research laboratories - specifically Frank Pabian at the Los Alamos National Laboratory - indicates that the Iranian effort is much too small for effective power generation, but perfectly suited for a nuclear weapons program. Pabian further postulated as far back as 2008 that if Iran was actually developing a civilian nuclear power program, there was no need to use front companies and locate the facilities in hardened underground bunkers. What was the rush to conclude a deal? Sanctions were taking a toll on Iran - the Iranians needed this agreement far more than we did. I am struck by the timing of these hurried negotiations. Just a few months ago, President Obama told the American people that our 50-year old policy toward Cuba was not working and it needed to change. Contrast that with our policy toward Iran - what we had in place was working. The sanctions protocols had brought the Iranians to the table - it was obvious to anyone with a modicum of experience in the Middle East that Iran was in a position of weakness. The answer to my last question is tied to the U.S. presidential election cycle. In November 2016, the Americans will elect a new president. Barack Obama will leave office in January 2017 - what will he have to show for it? Thus far, he has enjoyed a few domestic policy successes, all of them controversial and under threat of repeal should the Democrats lose the White House next year. Likewise, the President's foreign policy is in severe disarray, especially in the Middle East. This agreement with the Iranians - also a controversial "success" - will serve as his legacy assuming it is not overruled by a Congress representing an overwhelmingly skeptical American public, or cancelled by a Republican president in the future. - World powers have recognized Iran’s peaceful nuclear program and are to respect the nuclear rights of Iranian nation within international conventions. - The Islamic Republic of Iran is to be recognized as a nuclear technology power authorized to have peaceful nuclear programs such as complete nuclear fuel cycle and enrichment to be identified by the United Nations. - All unfair sanctions imposed by the UN Security Council including economic and financial sanctions on Iran are to be lifted as per the agreement and through issuance of a new resolution by the United Nations Security Council. - All nuclear installations and sites are to continue their work contrary to the early demands of the other party, none of them will be dismantled. - The policy on preventing enrichment uranium is now failed, and Iran will go ahead with its enrichment program. - Iran’s nuclear infrastructure will remain intact, no centrifuges will be dismantled and research and development on key and advanced centrifuges will continue. They did not mention that the arms embargo will be lifted in five years, and the missile embargo in eight years. I don't see how this is a win for the United States. I fear this is a repeat of a similar deal struck by President Bill Clinton with North Korea in 1994; we all know how that turned out. Although there are a variety of issues that need to be addressed with Iran, we have now given up any leverage we had. For example, what about Iran's continued support for terrorism, and what about the Americans currently being held in Iran? Have President Obama and Secretary Kerry sacrificed them on the altar of legacy? As I said, I hope this agreement stops the Iranians from acquiring nuclear weapons, but having worked in the region and on the Iran issue for decades, I fear the mullahs have outmaneuvered Messrs Obama and Kerry - again.